At McGill Bird Observatory our primary objective is to conduct standardized annual migration monitoring, which will enable us to analyze population trends over time. We are particularly interested in targeting boreal breeding birds, which are a growing conservation concern. However, there are significant costs involved in operating such a research program. We need your help to ensure we can maintain the consistent effort required each year to maximize the quality and value of our research. 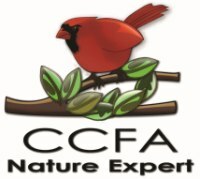 Become a McGill Bird Observatory supporter! The Northern Saw-whet Owl is a fairly common predator in the southern part of the boreal forest. Relatively poorly studied on its breeding grounds because of its secretive nature, the Saw-whet Owl is comparatively easy to monitor on migration. 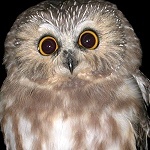 The desire to document their status in southwestern Quebec led to the establishment of MBO, and Saw-whet Owls remain the target of a special nocturnal monitoring program during the fall season. 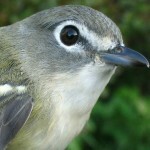 The Blue-headed Vireo is one of a few vireo species breeding in the boreal forest, and is representative of the dozens of insectivorous birds that migrate long distances to and from the tropics each year. The habitat at MBO is attractive to many of these species, especially as they refuel for the long journey ahead in the fall. Data collected at MBO are valuable in monitoring the populations of this and other neotropical migrants. 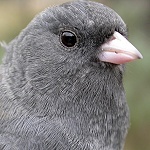 The Slate-coloured Junco is an elegant gray sparrow with a breeding distribution covering most of Canada's boreal forest. It is one of the region's most abundant breeding birds. Consistently monitoring the population of Juncos and other common species provides MBO with an opportunity to quickly identify trends that may also affect less abundant birds - our "canary in a coal mine" is a "junco in the mist net". 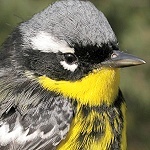 The Magnolia Warbler is one of approximately 20 warbler species with a widespread distribution across the Canadian boreal forest. Most of them arrive in the boreal forest in late May or early June, and are already beginning to return to their wintering grounds in Central and South America by mid-summer. Many warblers have shown signs of decline, and warrant close population monitoring at MBO and similar observatories. 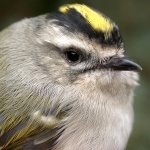 One of North America's smallest birds, the Golden-crowned Kinglet is a common resident of the boreal forest. Although they weigh only 6-7 grams, a few of these tiny insectivores overwinter in southern Canada each year. The majority, however, migrate to warmer areas in the United States, passing through McGill Bird Observatory in large numbers each October and April, and making this an ideal species to monitor for population trends. Last but not least, we want to take this opportunity to thank the many dedicated volunteers without whom it would be impossible to operate McGill Bird Observatory. Because the lists of names and number of hours contributed are continually increasing, we won't try to keep any running tallies, but rest assured that your contributions are greatly appreciated, especially those of you who are long-term and/or regular volunteers. You are all honourary members of our feathered flock of supporters!